Three years ago the ladies from Simple Simon started this amazing month-long series called Skirting the Issue. 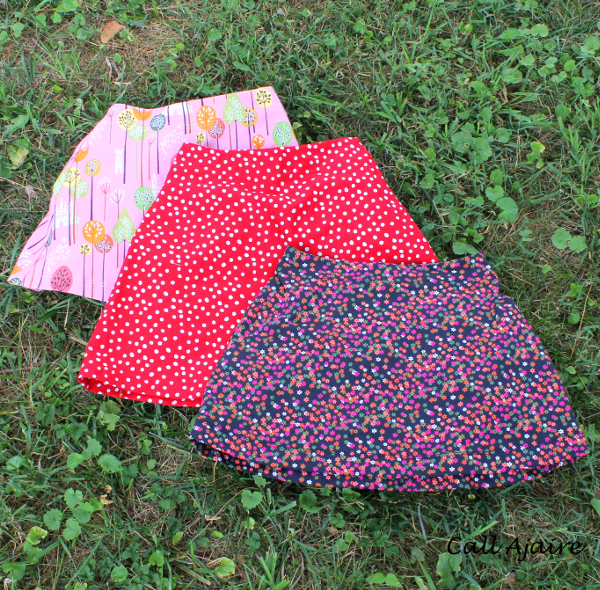 They dedicate the month of July to skirt tutorials that can be used to sew skirts to donate to local Foster Care Centers. If you’d like more info on how the project began you can click here. 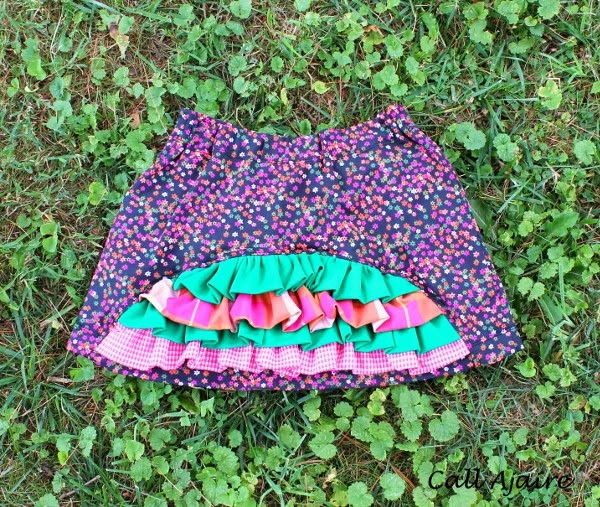 I am honored to be included in the mix with my Ruffled Arch Skirt tutorial. The front of the skirt is plain with a flat faced waistband, while the back has an elastic waist with a fun arch of ruffles. 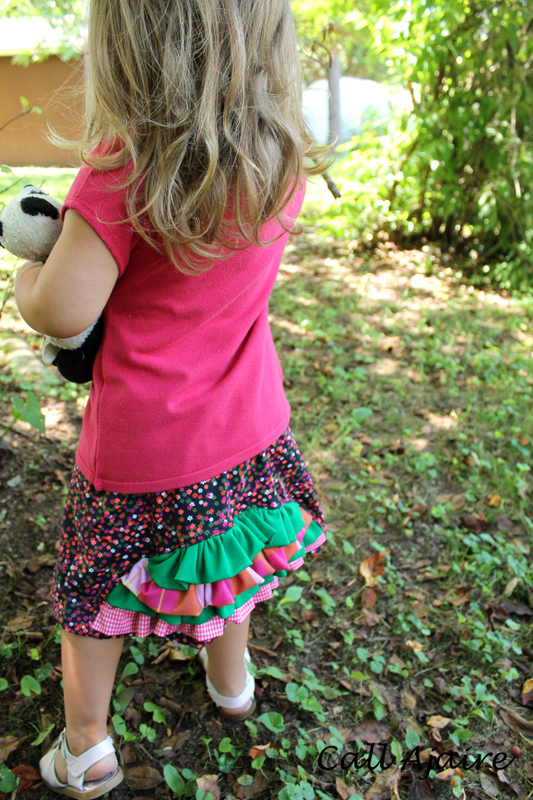 I’ll show you how to add a ruffled arch insert to your favorite skirt pattern, but you could also download the free 3T sized pdf pattern (*affiliate link) which already has all the pieces you’ll need for the 3T skirt. If you are using my pattern pieces you can skip ahead to assembling the ruffles. To draft a ruffled arch cut-out of your own you’ll first need your skirt pattern with seam allowance and hem allowance already included. 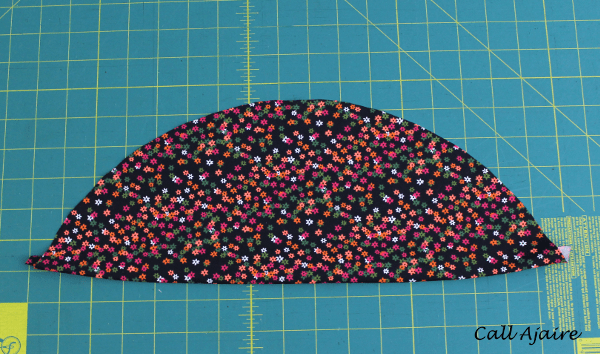 Trace the pattern piece so that you don’t alter your original. 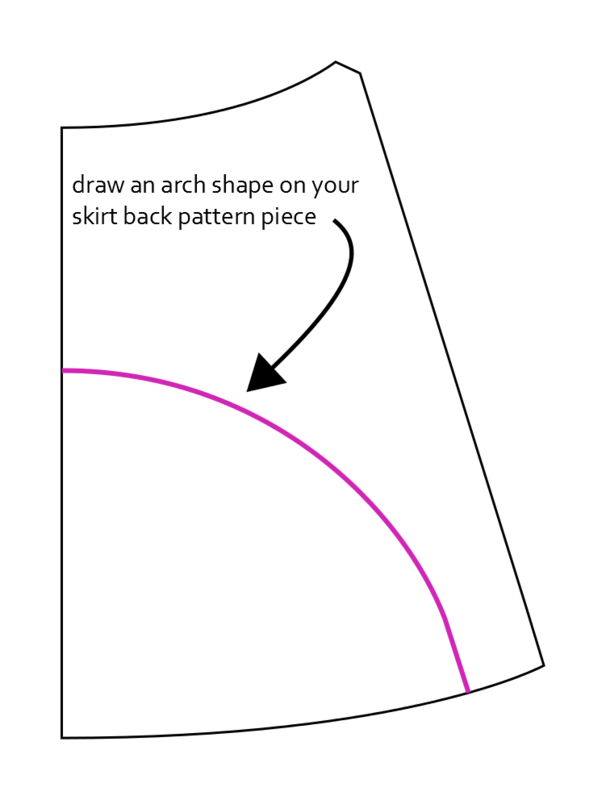 On the traced back pattern piece, draw a simple half arch shape starting about 1/3rd of the way from the top of the center back fold line and ending about 2 inches from the side edge at the hemline. 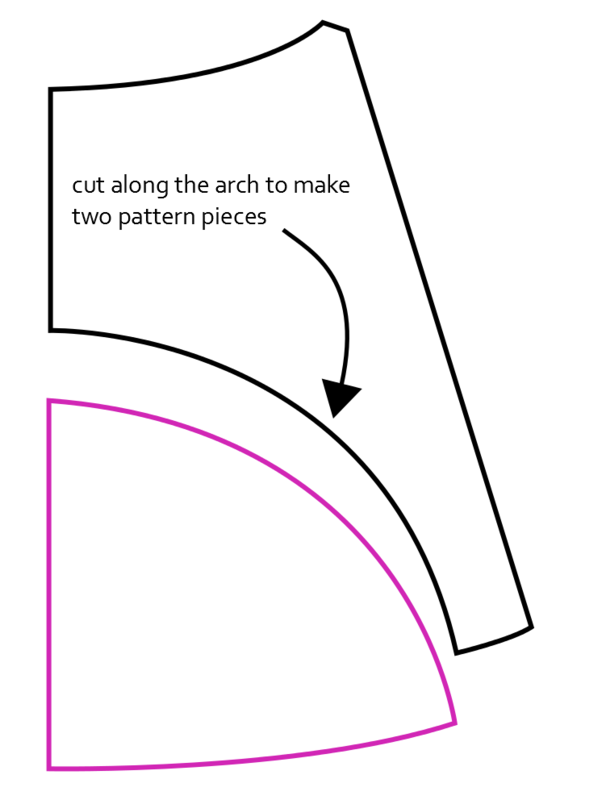 Cut the traced pattern piece along your arch to make two pieces. 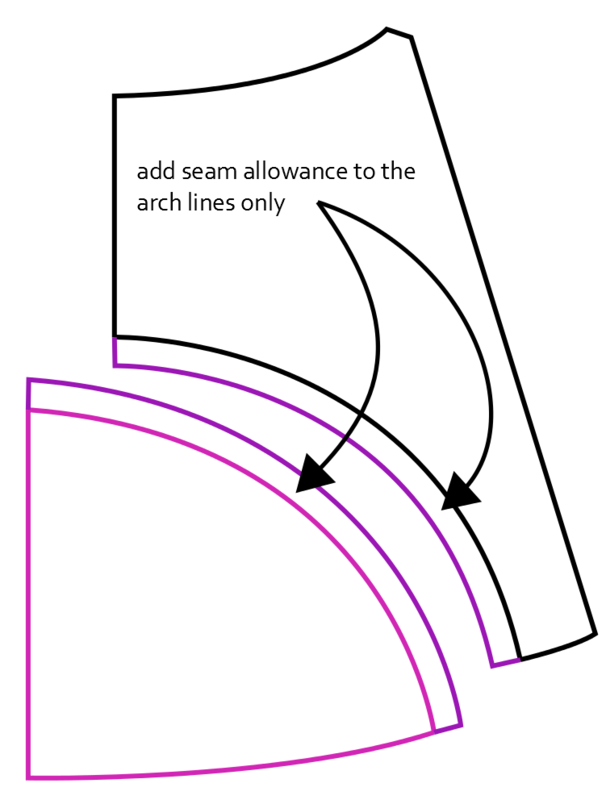 Add seam allowance to the arch lines only. Remember that the seam allowance and hem allowances were already added to the outside edges of your original pattern piece. 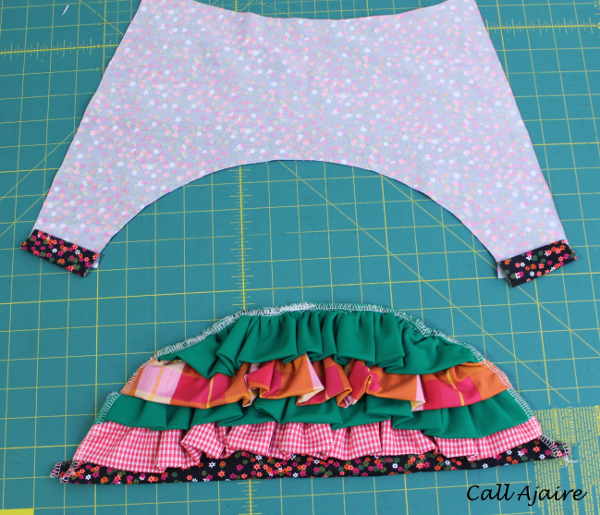 Now that you have the two back pattern pieces you can cut your fabric and start sewing the ruffled arch. 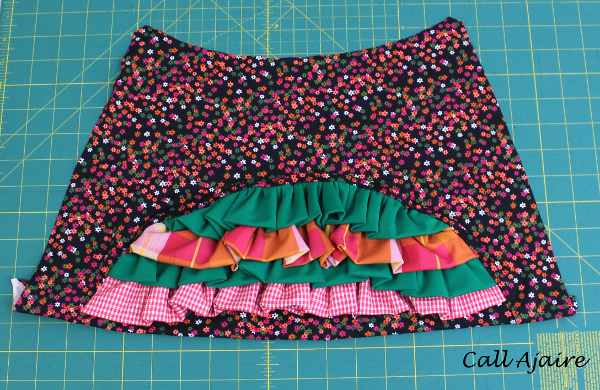 Cut out four ruffle strips using the pattern pieces or cut out four long rectangles that are twice the depth you’d like them to be and about twice the length depending upon how tight you like your ruffles to be. Fold the ruffle strips in half with wrong sides together so that the long edges meet. 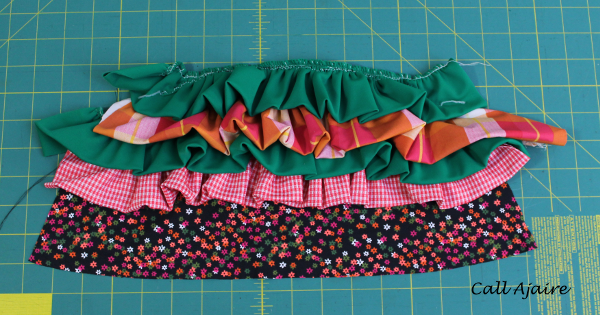 Sew a basting stitch across the long raw edge and pull the threads to make your ruffles. Now we will focus on the Lower Back pattern piece (the arch). 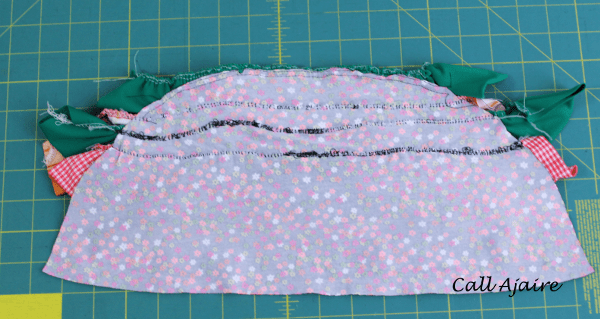 I like to press under the hem allowances (fold under 1/2″ and then under 1″ again) before sewing everything together because I find it helps to have the press lines when repressing the hem later. 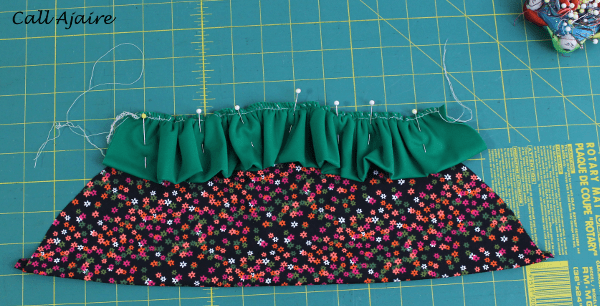 For this step it also helps to see where the bottom edge of the skirt will be. 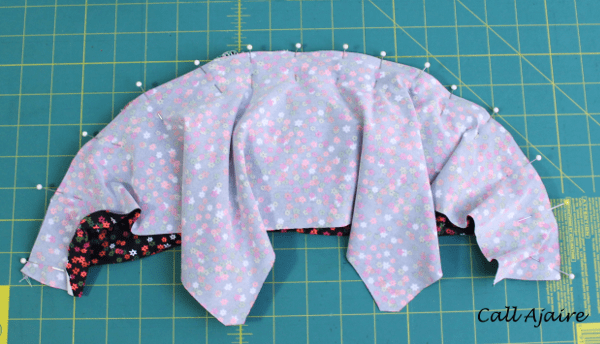 Starting at the top edge of the arch, pin your top ruffle to the arch. Baste the ruffle to the arch following the seam allowance of the arch. In the picture above you can see where to stitch. Leave the lower edges of the ruffle unbasted so that you can place your next ruffle underneath this first one. 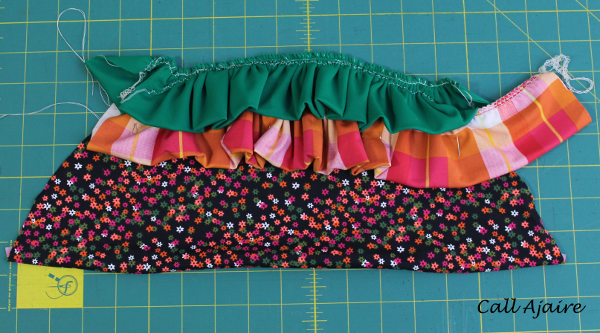 Take the next ruffle and pin it underneath the top ruffle, making sure to move the top ruffle up out of the way so it won’t get caught in the sewing. 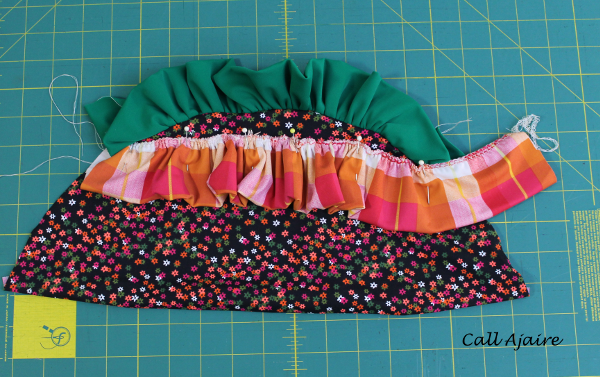 Sew this ruffle down to the arch along the top edge of the ruffle. It should look like this when the top ruffle is in place. 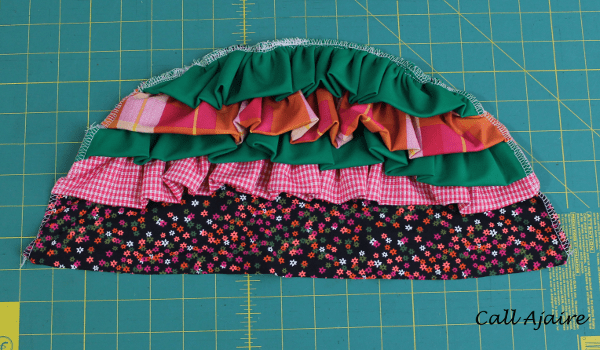 You’ll want each ruffle layer to cover the gathered edge of the next. Continue in the same way with the next two ruffles. When you get to the bottom ruffle you’ll need to unfold the arch hemline to be sure you don’t catch it when you sew the ruffle to the arch. The back of the arch will look something like this when all the ruffles have been sewn. You’ll need to ignore my crazy bobbin threads in this pic. Instead of pulling out my stitches I just resewed over the mistake, hehe. Once the ruffles are all in place, baste around the arch to hold the sides of the ruffles in place. After everything is basted you can trim all the excess around the arch. 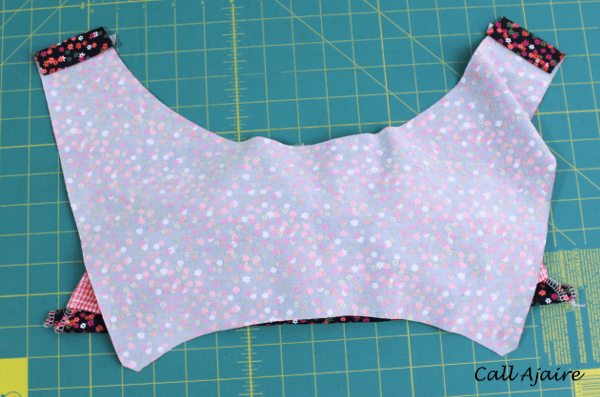 I prefer to just serge the whole arch, but if you don’t have a serger a basting stitch will work just fine. Next we’ll sew the Lower Bottom Back piece to the Upper Bottom Back piece. Right sides together, match the Upper Bottom arch to the Lower Bottom arch at the center points. Pin all the way around the edge, taking care not to pull the fabric along the curve. Carefully sew along the seam, catching the ruffles along the edge. 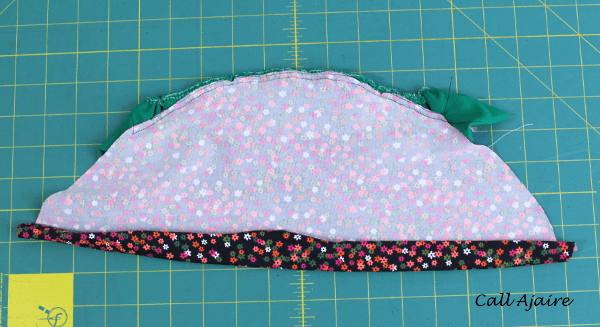 Finish this seam and press up toward the Upper Skirt Back. Top stitch along the seam which will help hold the weight of the ruffles and will keep it from sagging down. If you have any questions I’d be more than happy to answer them. Included in the pdf download is a solid back pattern piece without the arch cutout (piece G) which can be used with the front pattern piece and the two facings to make a simple skirt. 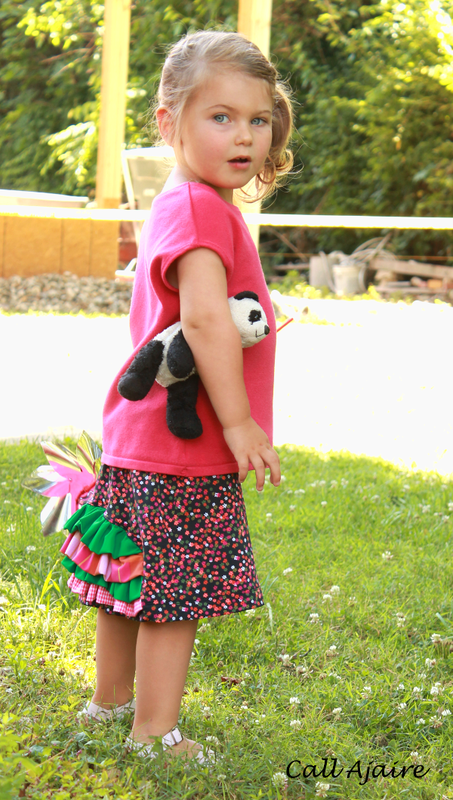 I made a few of the plain ones for Bean and they are really quick sews. From cutting to hemming, I can sew one in less than an hour. That’s perfect for making some to donate to Foster Care. I have some great fabrics I’ve already picked out. The top two in the picture above used quilting cottons, but the one in the tutorial and the bottom one in the picture was made using swimsuit fabrics. 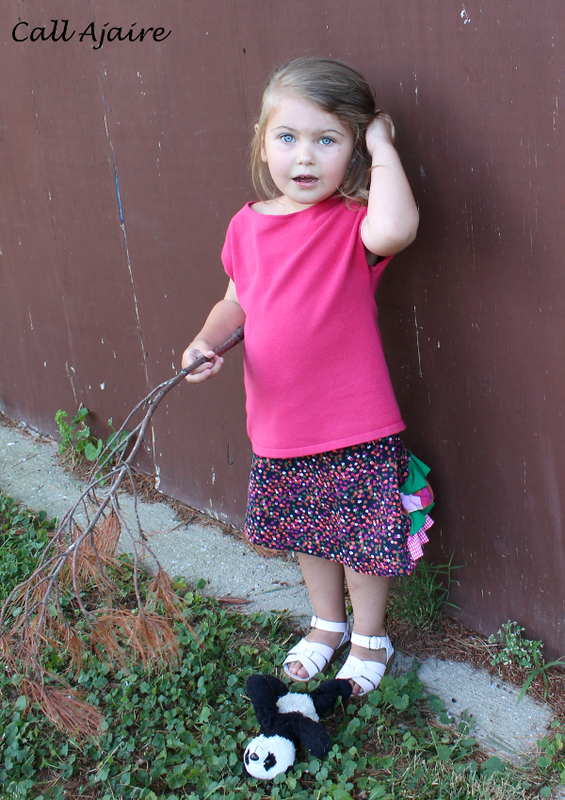 If you sew any skirts to donate this month, you should add them to the Simons’ link up. They have some great prizes they’ll giveaway to some random entries! I hope you’ll join in and sew along. 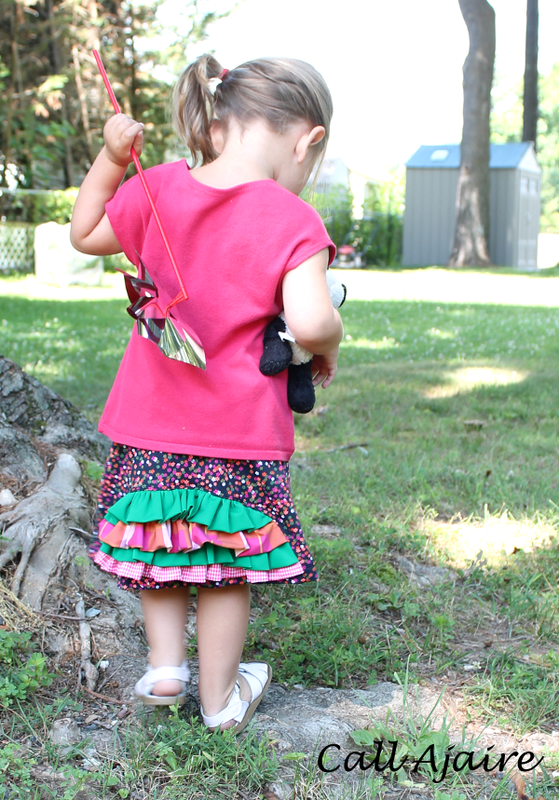 It’s such an important cause and skirts are so easy, it’s a fun way to help out! These are darling. I have some fabrics set aside to sew up for the skirts to donate as well. I may do one like this just for a little variety. Thanks for the great tutorial. Super cute little bustle inspired look! Adorable. The red and white is definitely my favorite. Fun color mixes and great tutorial! It's a great cause and series I'm glad they continue to host it. I'd love to hear you made one 🙂 And a HUGE thanks for the graphics comment. I think I'm finally improving!